Magical Urban Fantasy Reads: Elizabeth Norris Q&A! Unraveling Tour Stop! Elizabeth Norris Q&A! Unraveling Tour Stop! Me: I’m thrilled to welcome Elizabeth Norris author of the 2012 debut and the totally awesome Unraveling! 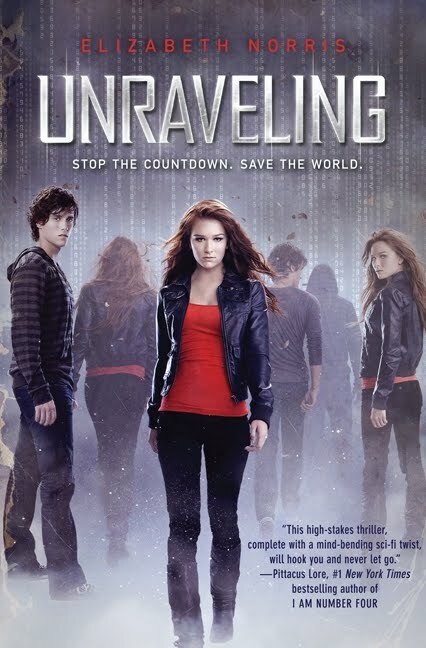 You can find my review of Unraveling HERE! Thank you for stopping by Elizabeth!!! Me: In 10 words or less tell us about Unraveling! Elizabeth Norris: Janelle’s fight to save her family, world, and Ben Michaels. Me: Was Unraveling the first book you ever wrote? Elizabeth Norris: I’ve written a number of other things. Unraveling is the first to be published. Most of my previous novels are buried on my computer or still waiting for me to finish them. Me: How did the story of Unraveling come to you? Elizabeth Norris: I was in a long distance relationship and thinking about people who were in love but were also from different worlds, and there’s something tragic and beautiful about star-crossed lovers. Similarly, I was also really looking for a thriller with science fiction elements to read, and I was having a hard time finding something, so I sat down and started writing what I wanted to read. Elizabeth Norris: I really like all the characters, but my favorite is Alex. He’s a good friend. He’s there for Janelle--he listens to her and supports her, but he also isn’t afraid to stand up and call her out on something if he thinks she’s wrong. Their friendship to me isn’t about him being secretly in love with her or anything, but rather it’s about the fact that they each found “family” in each other. Me: I like Alex too! Me: Do you have a writing ritual? Elizabeth Norris: In terms of where I write, I change it up a lot. I’ll write sitting at my kitchen table, sitting on the couch, at a coffee shop, or even the New York Public Library. Doing different things keeps me from getting complacent. But every time I start writing, I reread the last scene that I wrote the day before and I edit it a little. I might change a few lines or even just fix spelling errors, but that gets me in a good mindset to keep going. Me: Do you write on the fly or do you timeline? Elizabeth Norris: I’m a planner. When I wrote Unraveling I had about a thirty page outline that I divided up into chapter breaks so that I knew where each scene would begin and end. Some of that changed a little as I wrote, but I had a really good framework that kept me on task. I’m also very aware of how much I need to write each day in order to get the draft done on time. I don’t always meet that goal and some days I go over, but I’ve got it in the back of my mind which helps me stay on time. It’s hard to write that way, but now that I have deadlines I can’t just write whenever the mood strikes me. Me: HOLY CRAP! A 30 page timeline? Crazy! Me: What type of background research was required for writing Unraveling? Elizabeth Norris: I did pretty minimal research. A lot of the details in Unraveling, either the science or the law enforcement aspects are things that I read about beforehand just because I found them interesting. For instance, a few years ago after watching the first season of Lie to Me, I read a lot about facial expressions and what that can tell people if they know how to look. And a friend of mine works for the FBI so I asked him a few questions about what he looks for to know people are lying, and both my research and my friend’s answers came into play a little in certain situations when Janelle was either trying to figure out if someone was telling the truth or if she was trying to lie. I also read just about everything I could find in Scientific American and on the internet about multiverse theory, but I was never a good enough science student to really understand much of quantum physics. Me: One of the many things I loved about Unraveling was how well you developed the characters, particularly Janelle! I felt like her reaction to life challenges were very real and I was wondering if Janelle relates to anyone you personally know? Elizabeth Norris: Janelle is a lot like me--or at least she’s a lot like the person that I wanted to be in high school. I wasn’t as tough and I cared more about what people thought of me, but there are some definite similarities. Me: I'd like to be like her too! Me: Will there be a sequel to Unraveling? Elizabeth Norris: There will! The next book, which is titled Unbreakable will be out in 2013. Me: Yay! I can't wait!!! You are in the middle of escaping an apocalypse and you can only take things you can grab that will fit in a backpack! What would be in that backpack? Elizabeth Norris: Bottled water, a swiss army knife, super glue, rope, and a heavy sweatshirt or blanket. (I get cold easily). Me: Super glue? I'm not sure what I would do with that. Elizabeth Norris: I have some weird fears. The first one is teeth. Now, I’m not actually afraid of teeth themselves. But I get really easily weirded out when people talk about teeth or procedures that happen to or related to teeth. And I’ve had a few panic attacks when I have to go to the dentist. (I’m understating a little but it’s embarrassing). Elizabeth Norris: Chocolate and sour patch kids (but not together). Me: I wonder what they would taste like together? Huh! Me: What are your top 5 all-time fave books? Me: Top 5 books you have recently read? Me: Once again, thank you so much for stopping by and hopefully we will get the opportunity to have you back again! Check out the other Unraveling Tour Stops! Great interview U love finding out how a book got thought up. I have this one to on my Kobo and I've heard SUCH good things about it I'm seriously excited to read it!! Thanks for the interview Mindy! I love how the idea for the story is actually based on the author's real life! Fantastic interview! Chocolate and sour patch kids are two of my fave guilty pleasures as well. Really looking forward to Unbreakable!! Awesome interview questions Mindy! I love hearing about the author behind the book and how the book came to be. I'm so glad to hear there is a sequel! And I've heard such amazing things about this book I will definitely have to read it! :) Wonderful interview! I love your questions! Awesome interview!! I am really looking forward to this book. It sounds so good. I can´t wait to read Unbreakable. Great interview, Mindy! I love learning more about the author behind the book. Can't wait to read Unraveling!